Eclipse 3.2 JUnit runner gets confused connecting to server? I opened an Eclipse project today, ran a unit test, and got a socket exception I'd never seen before. The project was one I had set aside a few weeks ago after playing with the NetBeans 6 preview release. A socket connection error? I was just trying to run a local JUnit test, not connect with any remote server. My first theory was I must have been playing with remote debugging for this application a few weeks ago and configured Eclipse to connect with a remote JVM. I spent a minute going through the Eclipse configuration for the JUnit test to check out its settings. I saw nothing set for any remote JUnit connection. (I'm not even sure Eclipse's JUnit runner can do that.) Everything looked right, so I ran the test again and got the same connection refused exception. My second theory was that I hadn't rebuilt the application since upgrading to JSE 1.6.0_01 from 1.6.0, and that Eclipse was doing its best to find a running 1.6.0 JVM to connect with. (This seemed far-fetched, but a rebuild only took a couple of seconds.) A rebuild didn't solve the problem. My third theory was I had been using NetBeans for so long I must have forgotten how to run the JUnit test in Eclipse. Perhaps I was telling Eclipse to debug a remote application instead of running JUnit. I ran the test again, this time through the menu option. No luck. That sent me searching the web for the solution. I found it pretty quickly, but not the underlying reason behind the problem. Well, I did recently install the Groovy plugin. Did that cause the problem? If so, Eclipse thinks not being able to connect with the JUnit runtime is just a warning? Anyone have the real answer as to what caused Eclipse to get so confused while trying to launch the JUnit runner? None of the web pages I viewed talking about the problem mentioned the cause for the failure. I spent last Thursday at the International Trade Center in Washington attending Sun Tech Days 2007, the last stop in a 15-city world technology tour showcasing what's new in Java and Solaris. Here are some highlights of the day, and notes from the keynote address by Sun Microsystems CEO Jonathan Schwartz. Overall, the day was like a mini JavaOne: exposure to new technologies without actually teaching you how to use them. With most technical sessions lasting just 50 minutes, exposure is about all one can expect. Sun considers GlassFish a production-ready JEE 5 application server. I hadn't been following the GlassFish project, so it was good to learn about its relative maturity. GlassFish V2 (in beta) adds clustering support. Java 6 added features to JMX to make managed-bean development easier using annotations. I learned this in an aside during a JMX talk that focused on JMX features in Java 5. Yes, Java 5 has been out for almost three years, but Sun treats it like new technology because most companies and developers haven't migrated from 1.3 or 1.4. And it was good to hear Sun advocating and explaining JMX because developers could benefit from using its instrumentation and monitoring features in their applications, but the JMX learning curve has always been steep. jMaki tries to simplify Ajax development by unifying the APIs of popular Ajax libraries. jMaki provides JSP tags that help you call Ajax components from other Ajax frameworks, such as Dojo, Script.aculo.us, Yahoo UI Widgets, and Google's Ajax framework. Sun is focusing more on JRuby than Groovy because of Rails. This isn't actually new, but it was refreshing to hear a Sun engineer acknowledge that Sun's newfound excitement over JRuby is based on Rail's current sexiness quotient, and that attention to other JVM languages like Groovy likely will suffer a little as a result. Web 2.0 is still a vague concept. After I left the session on "AJAX and Web 2.0 Frameworks," two attendees both mentioned that they still had no idea what Web 2.0 means. The speaker never once defined it, and she left no time at the end of her presentation for questions. Sun engineer evangelists can get pretty tired after a 15-city world tour. One engineer played music from his laptop, drowning out part of another engineer's talk, and joked that audience members should use the corners of the room to relieve themselves. Another engineer went through his slides with the enthusiasm of a cow chewing cud, saying things like "as you can see in the code here" while the actual code was hidden because his NetBeans display had only about 40% of the real-estate showing the code window, and he was too tired to open the window or scroll the code to the right. Someone who didn't lack enthusiasm was CEO and President Jonathan Schwartz. He started the morning with a keynote address giving his vision for Sun's future. 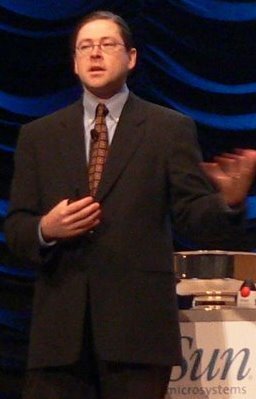 Schwartz is a thought-provoking speaker. His confidence provides a sense that you want to believe in his vision for success. As much as I think some of Sun's products are pretty cool, I still wonder whether Sun will succeed in differentiating its products sufficiently to win over the market. Schwartz's talk focused on market trends and how Sun will be there to satisfy the needs sparked by those trends. The number of consumers accessing the Internet keeps growing, he said, at the same time the cost of opening an Internet business keeps falling. "Barriers to entry have plummeted to near nothing," he said. As consumers go online, they'll want to store photos, post blogs, access bank accounts, and other services. The continuing growth of Internet consumers and businesses will require ever-better and larger network infrastructure, servers and storage--and Sun hopes to be there selling those products. Schwartz said the growth of Internet access will come mostly from consumers using mobile devices. More of the world uses a phone to access the Internet than a PC, he said. The United States is an anomaly in so many people owning expensive computers, he said. If you're going to meet the world's demand for mobile online access, "you're going to need to figure out how to work with that." One way Sun is going to work with the growth of mobile Internet devices will be to develop a new mobile-phone software platform called JavaFX. JavaFX, which includes JavaFX Mobile, is intended to make developing mobile phone software easier, and will run existing Java ME applications. Sun announced JavaFX at JavaOne last month, and released JavaFX Script, a new declarative scripting language to build "rich content" applications. Schwartz said Sun will release JavaFX as free open source software. The license will be partly restrictive. The JavaFX website says handset manufacturers will need to purchase an OEM license to embed JavaFX on their devices. Perhaps JavaFX will solve some of the difficulties developing mobile applications for Java ME, where every application has to be customized for nearly every possible device. Schwartz spoke at some length of Sun's commitment to open source software. He said Sun spent $500 million to release Solaris as open source, both in staff time and the cost of procuring intellectual property. 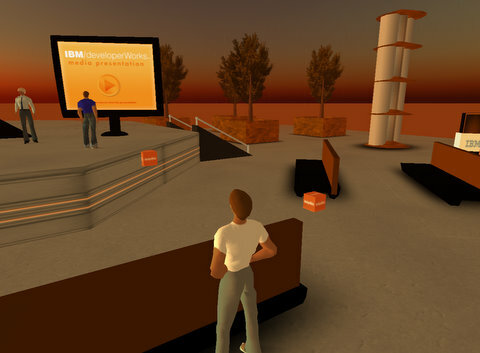 Sun also provides a free open source Java development kit, a free IDE (NetBeans), a free JEE server (GlassFish), and other open source projects that must cost Sun a large amount of money. no money and spends no money. It's you. And we love you." Sun's large investment in the free, open source software business is still one area I haven't figured out. My question has always been will Sun ever generate enough goodwill or product synergies to sell hardware to go along with that free software? Schwartz seemed to acknowledge the difficulty in transferring the gift of software into sales of profitable hardware: "Unfortunately the most important audience we have to serve has no money and spends no money," Schwartz said. "It's you [the developer]," he said with a laugh, "and we love you." Will the love from the developer community transform into money? 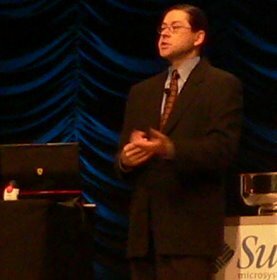 For example, Schwartz said that 70% of Sun's free Solaris operating system is installed on non-Sun hardware, like Dells and HPs. He said Solaris's exposure beyond Sun hardware opens the door to new customers. But do companies or developers installing Solaris for free on an x86 platform ever end up buying Sun blade servers, Sun disk arrays or Sun tape storage? He concluded by saying Sun will succeed by migrating away from commodity products toward innovative, market-leading products. Schwartz said the marketplace is split into segments growing faster than Moore's Law and those growing slower, which I took to mean the capabilities or innovations in some market segments is doubling every two years. The segments growing faster than Moore's Law, he said, are the consumer Internet, high-performance computing, simulations/analytics, and software as a service. Those growing slower are payroll, ERP, general ledger, and CRM. Products in the "slower" market segments will get cheaper every year. Although he acknowledged Sun makes its payroll selling commodity products attractive to the "slower" market segments, the growth (and profit) is in the faster segments. "If you're in our business," he said, "you don't want to hang out too long at the bottom." For innovative products, he mentioned Sun's focus on power-efficient hardware, its new Sun Fire X4500 storage server with 24 terabytes capacity at less than $2 per gigabyte, and its portable, self-contained data center that fits inside a standard shipping container (Project Blackbox). The primary costs in running a data center today, he said, are people to run them, real estate, and electricity, in that order. Sun is therefore focusing on products that reduce the need for human intervention, fit in a smaller area, and consume less power. Will the focus on high-margin, innovative hardware help Sun succeed? As a longtime Java developer, I have a special warm feeling for Sun. Sun gave us the Java platform. 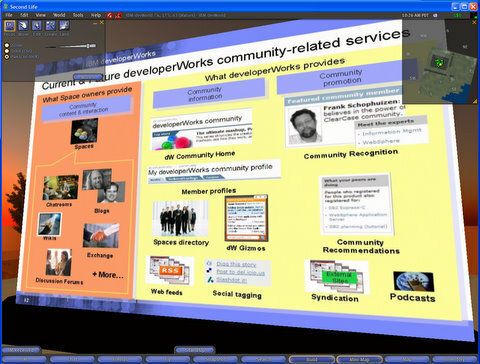 Sun donated the popular Tomcat web application server to open source. And Sun's recent attention back to Java developers has been heartening, with its major improvements to NetBeans, its development of GlassFish, and Java's new dynamic/scripting-language support, including the development of Ruby as a first-class JVM language. Yet most of what I heard from Schwartz on Thursday was that giving us all this software for free costs a lot of money, and Sun's focus needs to be on selling innovative hardware. What I didn't hear Schwartz explain was why Sun is focusing on free, open source software for developers -- how it helps Sun's bottom line -- and thus a strong feeling that the support will continue.